Many managers dream of becoming a Chief Executive Officer in China. Maybe they think that CEO stands for Cash Enhancement Opportunity - but of course, failure could turn the assignment into a Career Ending Option. So how can you ensure that your assignment in China is successful? Management Professor Fernandez and business journalist Underwood tackled this question by interviewing 20 top executives working in China, plus eight experienced consultants. They discussed topics like managing in China, setting up local operations, adapting regional/global businesses to China, tackling the local market and living in China. But how do you report the results of 28 interviews? The easiest solution would be to present each interview as a separate chapter. 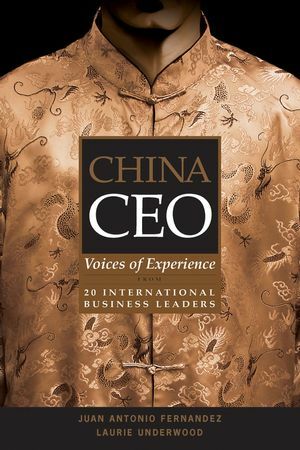 However, Fernandez and Underwood wanted to understand the challenges facing international executives in China today. So they took the harder - but more useful - approach of analysing the interviews and then writing about the main underlying themes, quoting from the interviewees to illustrate particular points. That approach means that topics like working with Chinese business partners or dealing with IP piracy are pulled together into a well structured discussion. But if you want to understand the specific experience of Philips, Sony or Unilever in China, the information is split up across many chapters. China CEO launches straight into the key question: What are the qualities of a successful international manager in China? Or to express it more personally: Are you the right stuff for China? Fernandez and Underwood cluster the essential qualities into three groups: professional qualities like having a rock-solid professional background and some previous international experience; global qualities like being adventurous and willing to learn; and China-specific qualities like being able to balance apparent opposites such as humility and strength, and patience and speed. The bulk of China CEO covers topics which directly interest all international managers, like managing Chinese employees, facing local and global competitors and dealing with the government. It also explores some important, but commonly ignored, aspects of having a successful assignment in China. There is a useful discussion of the challenges of living in China. Most expatriates enjoy their work, but the “trailing spouse” and children often have more difficulties with the experience. Fortunately, there are specific steps that companies can take to minimise the stress of relocation.